Asus Tek Computer Inc. is one of the most famous brands in the PC and laptop industry, and it’s no wonder you’ve come to check out our review of the ROG STRIX GL703VD. This particular model, even though it’s a gaming laptop in essence, is incredibly versatile and people from various lines of work, including music production, hold it in high regard and warmly recommend it. This review will help you find out what’s so cool about it, why, and who should consider it. The battery lifetime isn’t exactly exemplary. Even though you’ll be able to enjoy in your fun for quite a while, the recharge time is long. Keyboard warms up rather quick if your GPU gets too overburdened. Why should you consider Asus ROG STRIX GL703VD Laptop? Among the plethora of things you could like about Asus’ ROG Strix GL703VD lap, we’ve picked several prime benefits that most high-end laptops couldn’t provide you with. These include a beautiful design, a set of premium-quality speakers, a wondrous vivid screen, the bright lit keyboard, and some heavy hardware which will forever change the way you game. Let’s start off with the design – Asus ROG Strix features a sleek, slim outlook. The brushed aluminium lid is pretty durable and looks expensive, but the outer shell is made of moderately sturdy plastic. Fear not, though, as the overall durability rating of ROG Strix is quite high, way above average in fact. The carbon-fibre finish puts on some flair on the simplistic outlook, although it doesn’t affect its durability or performance. Secondly, the keyboard is quite big, and it’s quite awesome that the keys are lit with different colors – this help gamers organize their hotkeys more easily, programmers shouldn’t struggle too much to find that one letter they’re looking for after hours of coding and typing, and the same goes for music producers in general. The screen of Asus ROG Strix is one of its most amazing features. It’s big, fairly slim, and it features a resolution of 1920 by 1080 pixels. The 120Hz display works great for all sorts of purposes, although it’s clear that Asus intended it for gaming. You can use the V-sync feature if your selected frame rate is higher than sixty frames per second to further improve your experience. What’s more, the saturation is plainly perfect – it’s way above the average scale of sRGB standards with 92.8% coverage. Games, movies, animations, and colors in general look very rich and pronounced. Some people report that they’ve experienced lags and frame-per-second issues. If that appears to be your case as well, there are several things you could do to resolve the issue. Firstly, press the “Windows” button (found between control and alt) and type “Services”. There you’ll see a bunch of settings, and you’re looking for “Superfetch” – once you’ve found it, stop it. Find the Superfetch properties before disabling the service in its entirety. After that, switch back to the service panel and scroll down to the “Windows search” service. Just repeat what you did with the Superfetch service and you should be fine. Basically, these are not essential services and your laptop will work perfectly fine even if they’re off. 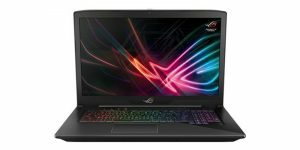 Who is Asus ROG STRIX GL703VD Laptop ideal for? Gamers have been the target group for Asus company for years, if not decades, and Asus’ ROG Strix didn’t change that. This laptop features some serious firepower, which is pretty surprising given that it’s so small and lightweight – that makes it perfect for all kinds of gamers and people who simply can’t get their hands off from their laptop during long, dull voyages. Apart from that, music producers would welcome it, as it features a set of premium-quality built-in speakers on top the brutally strong spec rig – it has everything you need to run the latest audio edit software programs, it’s user friendly, and we guarantee you’ll be happy with it. Asus ROG Strix GL793VD is a beautiful all-purpose laptop. It’s exceptionally strong, it looks beautiful, and the features it comes outfitted with are quite exquisite. Although there are several things that could’ve been improved (such as quick heat buildup), it’s clear that this laptop is among the finest you’d get for the buck – in fact, it’s quite cheap for a high-end laptop, and it holds a superb value for the buck.